Sports bar, originally uploaded by mission75. Lefty O'Doul's. The Bell in Hand. Pshaw. Youngsters. This is what a historic sports bar looks like. 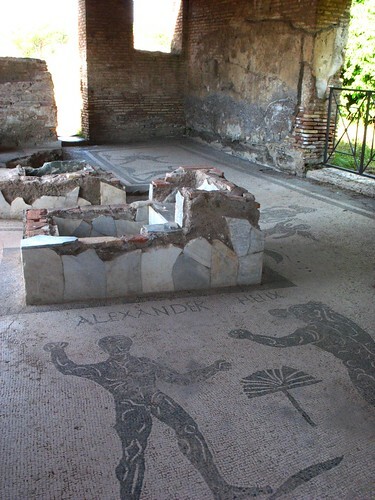 Part of the ruins of an inn on the outskirts of Ostia Antica, Rome's ancient port city, this room is decorated with mosaics of athletes on the floor. Since no self-respecting haven for weary travelers could be without a pub, and since buildings of the time were often decorated according to their function--the mosaics at the fishmongers' shop have a piscatorial theme, for example--I can only conclude that this was the spot to toss a few back and talk about last night's game. Or, er, gladiatorial match. So, how 'bout them Centurions?